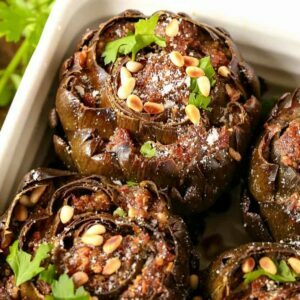 Grandma’s Best Stuffed Artichokes are so loaded with flavor, you’ll forget you’re eating a vegetable! 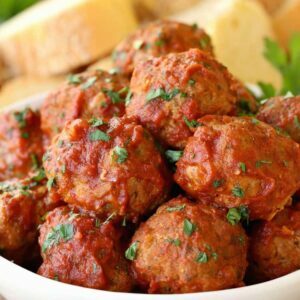 Stuffed with sausage and cheese, these could be a side dish or the main meal! 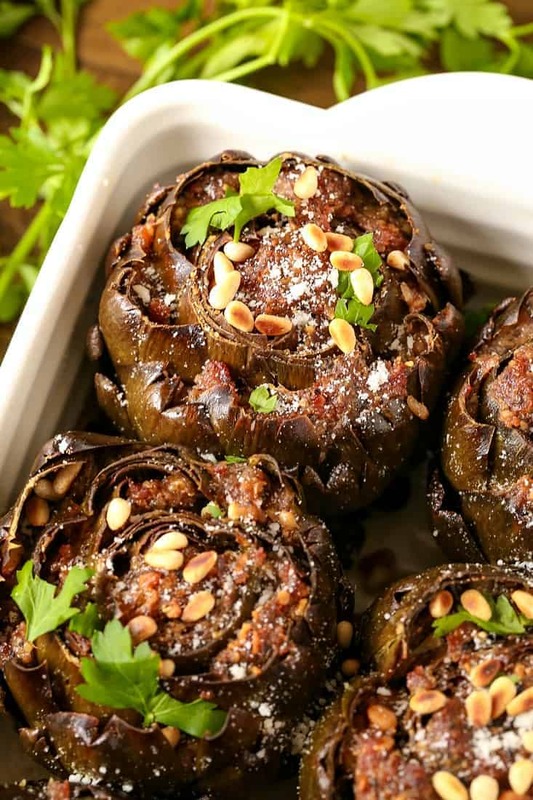 For day 4 of Side Dish Week we’re making these insanely delicious, oven roasted, Italian Stuffed Artichokes! Stuffed artichokes are a holiday tradition in my family, but we like to eat them a lot more than just during the holidays. There’s so many different recipes for making artichokes, like our Cheesy Stuffed Artichokes or Fried Artichokes. I’m even a fan of just steaming them and eating the leaves dipped in butter. What could be wrong about that, I ask. 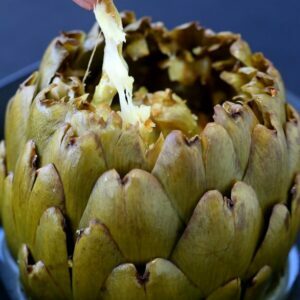 A lot of people are scared of tackling an artichoke recipe…I guess they do seem a little strange if you’ve never cooked them before but once you have you’ll see it’s really very easy. 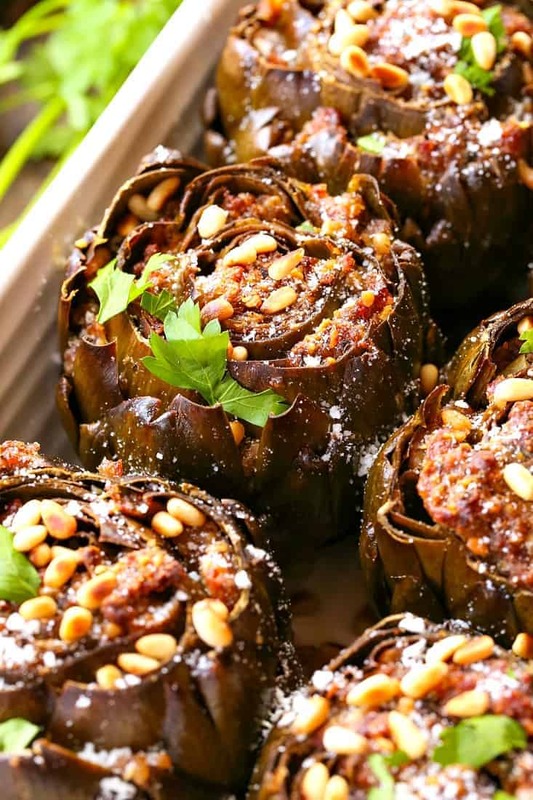 You can cook stuffed artichokes in the oven, like in this recipe or you can cook the same recipe right on the stove top. The cooking time is going to be about the same, it just depends on what part of the oven you need free. 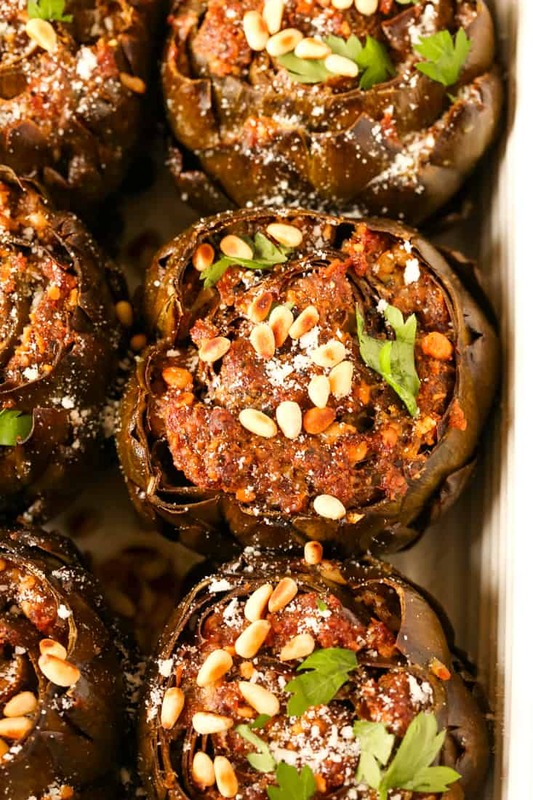 Cooking these Grandma’s Best Stuffed Artichokes in the oven might be a little easier since you really just put the artichokes in the oven and walk away. Cooking them on the stove top is almost as easy, I just like to stay closer by when anything is cooking on top of the stove. 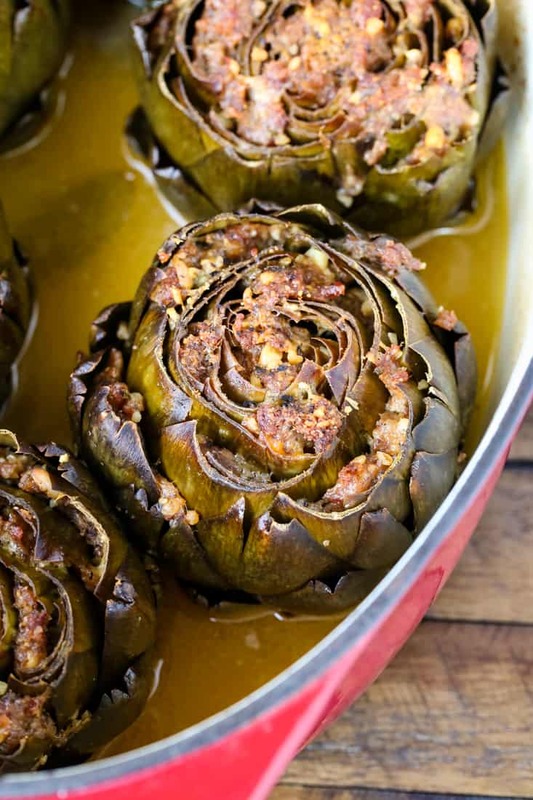 So let’s stick with an oven roasting artichoke recipe today! Like I said, these sausage stuffed artichokes are so satisfying they really eat like a meal. Definitely serve these for a side dish to steak or chicken or fish – and definitely you’re holiday meal. But if these stuffed artichokes are all you’ve got for dinner that night, you’re good. Promise. If you’d like to switch up the stuffing ingredients you can do that too! Great swap outs would be spicy sausage instead of regular sausage. Or you can swap out the parmesan cheese for romano or even mozzarella. The one thing I wouldn’t recommend is swapping out the pignoli nuts. If you want to leave them out that’s totally fine but in my opinion that’s the nut for this artichoke stuffing. Pignoli nuts or pine nuts are actually the edible seeds of pine trees. There are over 20 different types of pine trees that produce this edible nut but we only harvest the ones that are large enough to eat. Pine nuts can be used in many different recipes, sweet and savory. You can use pine nuts in cookies or cakes and chicken or meat dishes. And let’s not forget classic pesto recipes, pine nuts are perfect for those. Pignoli nuts have a very buttery flavor since they are very high in oil and you can detect a slight piney flavor when you eat them, almost like an anise flavor to me, not strong pine flavor like the tree. How Do You Cook Artichokes? There’s a few different ways to cook artichokes. You can steam them or fry them, stuff them or roast them. It really depends on which way you like to eat them. Fo this oven roasted artichoke recipe, start out by trimming the top part off the artichoke. Just enough to make them flat and to get rid of the pointy tips of the artichoke leaves. Next trim the stem off the bottom, making it flat so the artichoke can stand up straight in the pan. If you’re not ready to stuff these artichokes and cook them, you can let them soak in lemon water so the cut parts don’t turn brown on you. Otherwise if you’re ready, you can start stuffing! Once the artichokes are stuffed, place them in a covered dutch oven or roasting pan. The amount of water and wine you use will depend on the size and depth of your roasting pan, so I use a 1-4 ratio. One part white wine to 3 parts water. 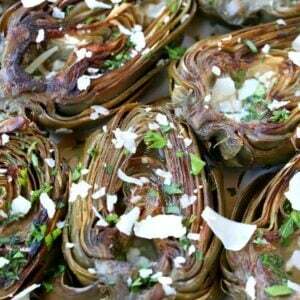 You only want the liquid about halfway up the artichokes so they steam properly in the oven. Drizzle the tops with olive oil, season with salt and pepper, throw in a couple bay leaves and off to the oven they go. After about 1 hour you can check these chokes to see if they’re done, pull out a leaf to see if it comes out easily and if it’s tender. You’ll probably need at least another 1/2 hour but I like to check them after an hour to see how they’re coming along. How Do You Eat Artichokes? This might sound like a dumb question if you’re an artichoke fan and you eat them often but I promise you, there are people that have NO idea how to eat these things. What you do is pull the leaves off the artichoke, get a leaf in your mouth and scrape the end of the artichoke off with your teeth. 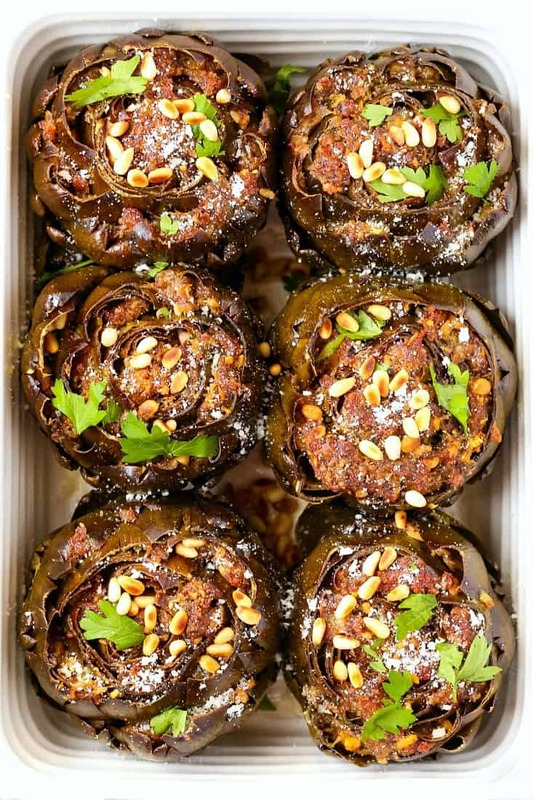 For these sausage stuffed artichokes you’re going to need a fork and knife to so you can get all the stuffing up with each leaf or just on it’s own. When all the leaves are gone it’s time to tackle the artichoke heart. Cut off any of the “choke” that’s on the top of the heart. That’s the furry stuff that you don’t want to eat. Some people remove that before cooking but it’s really a pain to do and it’s so easy just to scrape it off once the artichoke is cooked. Some people love the artichoke heart, some people don’t I can take it or leave it, my oldest sone eats everyone’s at the table and my little guy will definitely hand his over. Then if you’re up for it – go ahead and grab another artichoke and dive in all over again. I ate three of these bad boys for dinner one night with bread for the juice in one hand a and a beer in the other. Because there’s not much better! 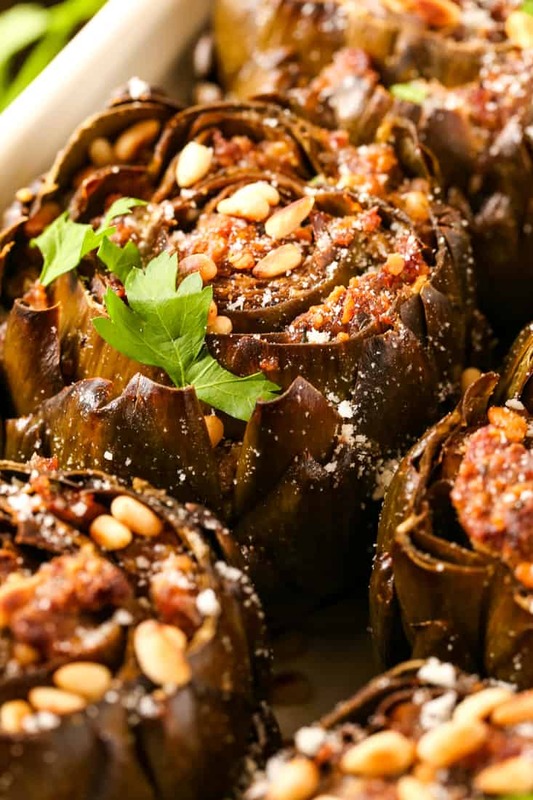 These delicious, Italian stuffed artichokes are a beautiful holiday side dish or a tasty addition to almost any dinner. 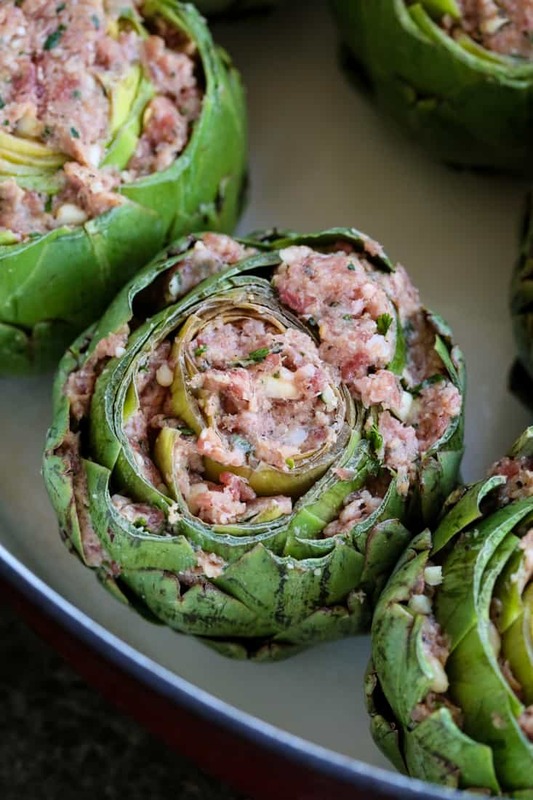 These sausage stuffed artichokes are so hearty they can even be a meal! Add the sausage, 1/2 cup of parmesan cheese, bread crumbs, salt, pepper and garlic to the bowl of a food processor. Mix the ingredients until incorporated then place the stuffing into a bowl. Prepare the artichokes by trimming the stems from the artichoke, cutting it flat so that the artichoke can sit straight in the pot. Next cut the top third off the artichoke top, making a flat cut across. Open the artichoke up using your fingers and pull out the center as much as you can so there is room for the stuffing. Don’t worry about scraping out the choke, you can do that after it cooks. Divide the stuffing into 6 equal parts and start stuffing the artichokes. Add a portion the center of each artichoke and then add the rest to the outside parts of the leaves. Place the artichokes into a dutch oven large enough to hold all the artichokes in a single layer, use two pots if you don’t have one big enough. Now add 1 part white to 3 parts water, filling the pot so the liquid comes up only halfway up the artichokes. If you are using a smaller pot you might only need 1/2 cup of wine to 1 1/2 parts water. Season the artichokes with more salt and pepper on top then sprinkle on the remaining 2 tablespoons of parmesan cheese. Drizzle the artichokes with olive oil and add the bay leaves to the cooking liquid. Cover and cook in the oven for 1 1/2 hours, checking the artichokes after an hour. The artichokes are done when a single leaf pulls out easily and the sausage is cooked through. When the artichokes are done, add each artichoke to a bowl and spoon some of the cooking liquid over each artichoke. Garnish each artichoke with a few more of the toasted pignoli nuts and fresh chopped parsley. * Toast the pignoli nuts in a dry pan, moving around often until they turn slightly browned and fragrant. * You can also cook these artichokes on your stove top. Bring to a boil then turn the heat down to a simmer over medium heat with the lid on but slightly ajar for some steam to release. The cooking time should be about the same.